Who needs a veneer or a set of veneers? 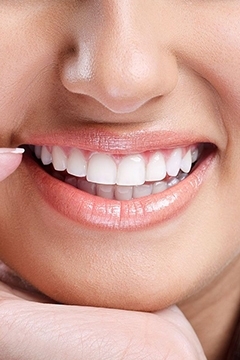 Which teeth are visible when you smile, and are you happy with them? A lot of Irish people have long-term tooth discoloration as a result of an antibiotic called tetracycline that was used years ago. Some have just one discoloured tooth that they’re self-conscious about; others would just love to have a smile to be proud of. For many people, it’s the top six teeth – often known as ‘The Social Six’ – that are most visible when you smile, but it varies from person to person. If you’re hiding your teeth, smiling tightly or closing your mouth in photographs because they are discoloured or misshapen, Smile Store – The Dental Specialist have a fantastic solution for you. Porcelain veneers are very thin shells of medical-grade ceramic that are attached to the front surfaces of teeth for an immediate smile transformation. Individually crafted for each patient, these cosmetic enhancements are made from advanced material that closely resembles the appearance of natural dental enamel. These shells are bonded to the front of the teeth changing their colour, shape, size, or length. We use porcelain veneers as they resist staining an mimic the natural light reflecting properties of natural teeth. Procedure for Getting a Dental Veneer Getting a dental veneer usually requires three trips to the dentist – one for a consultation and two to make and apply the veneers. One tooth or many teeth can simultaneously undergo the veneering process described below. Diagnosis and treatment planning: This first step involves your active participation. Explain to your dentist the result that you are trying to achieve. During this appointment, your dentist will examine your teeth to make sure dental veneers are appropriate for you and discuss what the procedure will involve and some of its limitations. He or she also may take X-rays and possibly make impressions of your mouth and teeth. Preparation: To prepare a tooth for a veneer, your dentist will remove about 1/2 millimetre of enamel from the tooth surface. Next, your dentist will make a model or impression of your tooth. This model is sent out to a dental laboratory, which in turn constructs your veneer. Bonding: Before the dental veneer is permanently cemented to your tooth, your dentist will temporarily place it on your tooth to examine its fit and colour. They will adjust as needed. To prepare your tooth to receive the veneer, your tooth will be cleaned, polished, and etched — which roughens the tooth to allow for a strong bonding process. A dental cement is applied to the veneer and the veneer is then placed on your tooth. A special light will be used to activate the chemicals in the cement to make it harden quickly. Finally, any excess cement is removed; you bite evaluated and any further adjustments are made.